Damn. Another incredibly depressing episode of Dexter this week ("Hello, Bandit") that finds our hero still dealing with the after-effects of Rita's death. Dex is still struggling to come to terms with being a single dad while still continuing his serial killer "work." Dexter receives a bit of good news in that the FBI does not consider him a suspect in the murder of his wife. Due to his being at Arthur Mitchell's (aka Trinity) home when it was raided, the authorities know there was no way for him to have been there and at his home killing Rita. There is still the issue of "Kyle Butler," however. The remaining Mitchell's each gave descriptions to a sketch artist, but the drawings do not appear to look like Dexter. Or do they? Quinn is still quietly suspicious of Dexter, and while at home, he begins putting the three sketches together to form a more accurate rendition of "Kyle" (aka Dexter). It appears that even with the burgeoning relationship between him and Debra, Quinn is not letting go of his suspicions of Deb's big brother. Back at work at Miami Metro, Dexter is told to take a few more days off. This forces Matsuka to handle all blood duties, and he is not happy about it. The scenes with Matsuka are the only comic relief in an otherwise sad episode. When the kids - Cody and Astor - express interest in going back to their house, Dexter quashes the idea. He doesn't think it will be healthy for the kids to see where their mother was killed. But the kids end up ditching school after a therapy appointment and trekking across town to their old house. Dexter finds them both at home staring at the bathtub where Rita died. Without the possibility of living at the old house or staying at Deb's crowded apartment, Dexter decides to find the family a new place. He rents a moving van. But while inspecting the van, he sees a tiny spec of blood in the back, and it becomes so distracting to him that he stays up all night trying to figure out how it got there. He even brings out baby Harrison with him while he tests the blood drops to see if they are human or animal. Turns out, it's human. Dexter learns the name of the last person to have rented the van, and begins his research on the man. He eventually follows him out to a swamp and watches as he dumps a barrel into the water. Dexter investigates a little further and finds a dead woman inside the barrel, and notices a number of other barrels in the swamp. It looks like Dexter has found his next "target." Back at Deb's apartment, Dexter reveals to his sister that Astor and Cody are going to be living with their grandparents in Orlando. While Dexter is unhappy about it, he respects their wishes and hopes that someday in the future they can all live together again. Cody does not want to go, and tells Dexter that he'd like to stay with him. 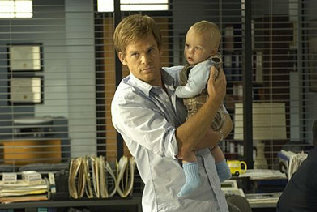 But Dexter explains to him that it is important that he and his sister stay together - much like how Deb and Dexter do. It was a very emotional moment when the kids were leaving. There wasn't much revealed about next week's episode other than a brief shot of Quinn calling the Mitchells and asking them to look at a photo. The photo is of Dexter. It seems that Dex is not 100% off the hook for Rita's murder (according to Quinn). Since we all know he is innocent of that murder, I am curious what Quinn's further examination will reveal about Dexter's secret life. I see Dexter having a tough time explaining how it is the Mitchells identified him as Kyle Butler. I look forward to him spinning his way out of that one.